Exotics evoke mystery of foreign origin. The wide array of fruit and flowering trees listed in this section contain plants unfamiliar to some. By providing horticultural, cultural and general information about these plants, we hope to encourage people to seek out and try these varieties and consider adding them to their orchards and gardens as welcome additions to the yard. 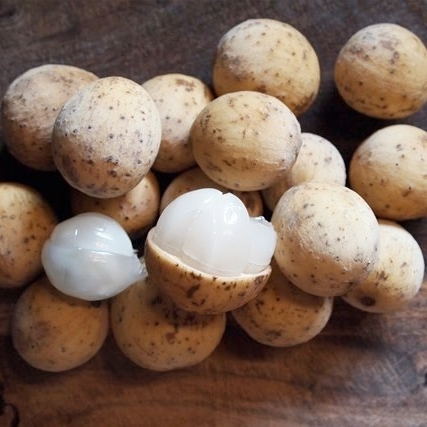 Abiu is delicious eaten fresh and has a flavor often described as “butterscotch caramel.” The white, sweet, translucent flesh is enclosed by a tough, thin, yellow skin. Native to the Amazon, Abiu is tropical in its requirements, needing a moist, warm climate. Abiu is a smallish tree growing 12 to 15 feet tall, with long, light green leaves. The baseball-sized fruits are round or can be slightly oblong (depending on the variety), and are bright yellow when ripe. The best varieties are 'GRAY', 'Z-1', and 'Z-2', all selections are from Queensland. Acerola fruit has one of the highest natural amounts of ascorbic acid or vitamin C, just one will satisfy the daily adult requirements. The fruit is tart and makes an excellent jelly. The attractive pink blooms are followed by the bright red, juicy, cherry-like fruits and are abundant on the bush-like trees several times a year. Acerola is very adaptable and thrives with regular care and fertilization. Keep pruned to about 10 feet for easy harvest throughout the year. Dwarf Apple Bananas are a popular fresh eating banana in Hawaii. The fruit is known for its tart, sweet flavor and thin skin and have a long shelf life and are excellent for drying as they do not brown in the process. The trees are tolerant to wind, and grown best in the moist lowlands with good drainage, but are very adaptable and grow well in most climates in Hawaii. Bananas grown faster, healthier and produce bigger fruiting stalks when fertilized regularly. Betel nut is the seed from a tall thin palm from Southeast Asia that is often chewed, wrapped in betel pepper leaf and smeared with lime, as a gentle stimulant. Clove, cinnamon, or cardamom is often added for flavor. Betel nut grows best in lowlands with abundant moisture and slightly acid soil. Fertilize the trees regularly with a balanced fertilizer. The palm will begin to bear in about five years. There is also a compact, dwarf variety that is easy to harvest. Bilimbi is a relative of Carambola or Starfruit but is very different in taste, flavor, and appearance. The tree is attractive and grows to 10 to 15 feet. The flowers are small and fragrant and will emerge right on the trunk and oldest branches, followed by the pickle shaped tart fruits. They are similar in taste to a tart apple. The fruit is mostly used in curries, chutney, jelly or pickling. Ripe fruit will only keep a few days after picking. The fruit is ready to pick when the skin changes from bright green to yellow-green. Trees grow best below 1,000 feet and are not tolerant to salt. Black Sapote, a close relative of the persimmon, is chocolate-colored with the texture of a soft peach. The fruit is usually eaten fresh and can be mixed with lemon juice and honey to make a ‘mousse’ or whipped into desserts such as ice creams and cheesecakes. The tree can be grown in higher elevations. It grows tall (up to 20 feet) in the lowlands and about half as tall when grown in higher elevations. The tree is native to Mexico and is one of their most popular fruits. It is a beautiful tree with large glossy green leaves with unusual flowers and takes about five to seven years to begin bearing. The Brazilian Cherry is considered the best of the Eugenias. The skin is thin, firm and exudes dark-red juice. The white pulp is juicy and tastes much like a true sub-acid or sweet cherry. It is usually eaten fresh but can be made into jam, jelly and wine. The hardy, adaptable tree stays small and compact and fruits several times a year. The interval from flowering to fruiting is short, and the fruit ripens quickly and all at once. The trees are sensitive to herbicide. Breadfruit is an equatorial lowland species that grows best below elevations of 1,000 feet, but is found at elevations of 2,000 feet. Trees grow best with rainfall is 60 to 120 inches per year, and soils that are neutral to alkaline. 'Ma’afala' is the preferred variety, bearing quickly and consistently. Other varieties include 'Apuapua', 'I'o’ I'o', and 'Tahitian'. Breadfruit is an important crop in Hawaiian culture with an abundance of preparations from sweet to savory dishes to more modern applications such as flours and hummus. Breadfruit can be very productive and bear fruit for up to 60 years. They are good sources of potassium, fiber, calcium and Vitamins A and C.
Cacao seed is the basis for commercial chocolate or cocoa. It is native to Central America and was sacred to the Aztecs. The tree produces football-shaped pods about 8 inches long directly on the trunk and branches. They are ready to pick when the skin turns either red or yellow (depending on variety). Inside are numerous large (20 to 50) seeds covered with a white fruity pulp. The cacao tree is a small evergreen (10 to 12 feet) that grows best with high humidity, deep rich soil, and at least 60 inches of rain per year. Cacao prefers the lowlands below 2,000 feet. Young trees require partial shade until they are at least four feet tall and can be interplanted with bananas or palms. Cacao is long lived and can produce for up to 50 years. Cardamom spice is the seed in the flower pods from a tall willowy ginger. The orchid-like flowers are small and on stalks that usually trail along the ground. The spice is used in flavoring curries, coffee, cakes, bread, and other sweets. Cardamom is a among the world's most expensive spices and is also used in perfumes, to flavor liqueurs, and medicinally as a stimulant. It grows well in our tropical rainforest climate. The plants should begin to produce flowers in about three years. The leaves die back in the winter and emerge each spring. Cinnamon is an ancient spice with roots dating back to 2,000 BC. It has a wide variety applications ranging from baked goods and drinks to incense and perfumes, and is a wonderful tea for a cough. The inner bark of the smaller branches is the part used to make the spice. Cinnamon can be grown easily in Hawaii with adequate rainfall. Cinnamon trees are very sensitive to herbicide, mulch is a better weed control. Prune to encourage a bushy tree that is easy to harvest. Cinnamon is a rich source of vitamin K, Iron and Calcium. Cloves, believed to be a native of Indonesia, are beautiful and graceful trees, with stellar pink and yellow new leaves all year round. Cloves are slow-growing trees that do best on deep volcanic soils with abundant rainfall and good drainage, they can be grown at most elevations throughout the state. The trees and leaves are very fragrant and the developing flower bud is dried and used as the spice. Cloves are used whole and ground in a variety of sweet and savory applications as well as in tinctures and cosmetic applications. Coffee is native to tropical Africa and is grown for its berries which are picked, pulped and processed to produce a dried seed which is roasted. Hawaii’s coffee is considered by many to have the finest flavor in the world due to the rich volcanic soils and optimal climate. Coffee is a dark green, small tree, growing to 15 feet unpruned. Many commercial trees are kept at half that height. All ‘Kona Coffee’ is C. Arabica. There is a dwarf C. Arabica called 'Cattura'. It is a highly productive tree with high quality beans. There is also a ‘Coffee Liberica,’ which is a large tree with large leaves, flowers, and berries, and has been used to make instant coffee. Coffee is grown in most Hawaii climates. The trees require regular fertilization. Local companies process and roast homegrown coffee for clients to sell or give as gifts. The Curry Leaf is a thick bush or small tree with small leaves. It is grown primarily in southern India for its aromatic leaves, an essential ingredient in Madras curry. The leaves can be used fresh or dried in cooking, the oils are often used in soaps and cosmetics, and the fruit can be eaten fresh. The plant bears clusters of attractive white flowers with purple fragrant seeds developing afterward. It grows well in Hawaii with adequate water and regular fertilization at most elevations in the state. It is an attractive bush and can be kept small next to an herb garden. Figs are delicious and easy to grow. Figs are eaten fresh, made into preserves, cakes and dessert fillings. The small deciduous trees grow in most areas of Hawaii, although too much rainfall can stall its growth. The fruit is borne on the new flush several times a year. Do not be alarmed when the tree loses its leaves in the winter, new growth and fruit will appear soon after. One improved variety is ‘Brown Turkey’ which has a purplish brown fruit with a pink flesh and is a closed-end type (self-pollinating). ‘Brown Turkey’ has a low spreading habitat. ‘Kadota’ is a more upright, vigorous tree, the fruit is a rich amber flesh with a pale green skin. 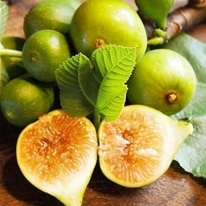 ‘Kadota’ is an excellent tasting all-purpose fig. 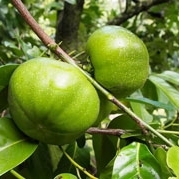 ‘Magnolia’ is another variety that is excellent eaten fresh and grows best in Leeward or coastal locations. Guavas range from sweet to acidic, with the acid varieties grown for juice and processing, and the sweet varieties for fresh eating. The trees are very vigorous and can be grown virtually anywhere in Hawaii. For commercial production, or backyard harvesting guava trees need to be pruned. Dessert guavas include the ‘Philippine Swirl’ a fragrant and sweet selection of pink and light yellow swirled flesh. ‘Ruby x Supreme’ is a sweet rich pink variety developed in Florida and known for its flavor and dependable bearing. ‘White Indonesian’ is a delicious, white fleshed high quality eating variety with large 5 to 6 ounce fruit. ‘Ka Hua Kula’ is a juice variety selected from the Waiakea Experiment Station as an improvement over ‘Beaumont’, the former standard for juice. Jaboticaba trees are native to Brazil. The trees are bushy, slow growing and reach about 15 feet in Hawaii. The round purple fruit are borne directly on the trunk and branches. The fruit is sweet and delicious, somewhat like a ‘Concord Grape’, with slightly tough skin, and can be eaten fresh or preserved as wine or jelly. The trees take four to six years to bear fruit and will bear two to three times a year. Flowers are very fragrant, and trees can tolerate wind, and shade and can be grown up to 1,500 feet in elevation. There are two types available in Hawaii, ‘Murta’ has smaller fruit, about 1 inch, and ‘Paulista’ has larger fruit, about two inches in size. 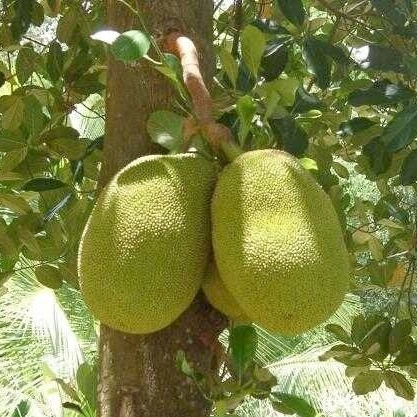 Jakfruits are very large fruits weighing 10 to 40 pounds or more and are borne on the trunk and branches. The thick pulp covering each seed is sweet and has a wide range of uses. It can be eaten fresh and is often used curries and soups, or dried as chips and the large seeds and leaves are also used in culinary applications. Jakfruit does not require special care but prefers the lowlands, well-drained soils, and some fertilization. The trees are large, but can be shaped, so give them plenty of room. Two popular cultivars are ‘Black Gold’ a firm fleshed, tasty large fruit and ‘Ziman Pink’ a “dwarf” cultivar with smaller round fruits about four to eight pounds with delicious flavor. Langsat is a very popular fresh eating Philippine fruit also known as ‘Lansone’. Beneath the tan skin, the small fruit is divided into a few segments of translucent, juicy flesh. The flesh is slightly acidic and sweet in taste. The fruit is borne in clusters off the trunk and branches of the tree. The tree is tropical in requirements and should be grown in the lower elevations, needs wind protection, and can be grown in the shade. The trees are slow to come to fruit bearing stage. Longans are native to China and are usually eaten fresh but are also dried, canned, or made into delicious dessert sauces and sorbets. It is a delicious, juicy fruit with a very sweet flavor, and a single seed. It is a large spreading tree which is easily managed with annual pruning. It produces best below 2,000 feet. ‘Biew Kiew’ is a popular commercial variety that has large sweet fruit, bears well and has a good shelf life. ‘Sri Champoo’ is another recommended variety that has large beautiful, sweet fruit, but not the shelf life of the ‘Biew Kiew’. Trees prefer full sun, and need wind protection and good drainage. The fruit is high in vitamin C and has been known to aid in digestion and is used in other medicinal applications in Eastern Medicine. Loquat is native to China and related to apples, pears and quince. The fruit is juicy and firm with a mild sweet taste. When ripe the fruit is bright yellow and has an easy to peel thin velvety skin. It is delicious eaten fresh and can also be prepared in many ways, including jams, preserves, cake fillings, and served in fruit salads. The tree is vigorous, medium height and grows well in most locations in Hawaii but fruits best in the upslope areas. Loquat can fruit several times a year. There are two improved cultivars available, 'Golden Nugget' and 'Mammoth'. Lychee is one of Hawaii’s most popular fruits. The season is short and the red sweet fruit is savored by everyone. The Lychee is best eaten fresh out of hand but can be dried or used in desserts. The large beautiful trees thrive in a moist rocky soil and benefit from high potassium fertilizers once they reach fruiting age. Lychee need to be protected from strong winds, and can be easily managed in height and shape with annual pruning after harvest. There are several popular varieties that grow well in Hawaii. The ‘B-3’ is very sweet and has a reddish orange skin. It is a consistent bearer, fruiting around July after the 'Kaimana' season. Emperor is a very large fruit, bears late in the season and the tree is compact. 'Groff' is a mid-season, small fruit with ‘chicken tongue’ or undeveloped seed. The 'Kaimana' is the most popular cultivar because of its consistent bearing habits and high fruit quality. The large fruits are ripe between May and July. Proper fertilizing and pruning are essential to fruiting on a yearly basis. Macadamia Nuts, native to Queensland are delicious and easy to grow in Hawaii. The trees produce well with minimum care, and need well drained soils, wind protection, and at least 50 inches of rain a year. The trees are slow to mature and need about 8 to 12 years in the ground to reach full production and produce for decades. There are several selected varieties for Hawaii. '344' or 'Kau' has large, high quality nuts along with high productivity. It is one of the most popular commercial cultivar in Hawaii. '741' or 'Mauka' is another high quality and very productive nut. The Magnolia is a stately, beautiful shade and flowering tree. It is striking with its large dark green leaves and contrasting huge white fragrant flowers. The flowers bloom throughout the spring and summer attracting bees from everywhere it seems. Mamey Sapotes flavor can be described as a delicious combination of pumpkin, sweet potato, and maraschino cherries. The fruit’s texture is creamy and sweet and best eaten fresh or in ice creams or smoothies. A mamey sapote is ripe when the flesh is orange when a fleck of the skin is removed. Two cultivars are available. ‘Magana’ is a large football-shaped fruit about two to three pounds, and ‘Pantin’ a large round fruit about one to two pounds. The trees have a spreading habit and grow best under 2,000 feet. Mangosteen is referred to as the “Queen of Fruits,.” The fruit is apple sized, round, purple-brown, with a smooth, thick skin. The flesh is white and considered the most delicious fruit in the world. The flesh is eaten fresh and many health products are made from the fruit and skin. The slow growing trees require tropical conditions, plenty of moisture and protection from wind. The trees take between 7 to 12 years to fruit, depending on care and location. Miracle berry is a slow growing, small upright bush, easily grown in a container. The berries are small with a red skin, white flesh and a large seed. When eaten, a molecule from the flesh binds with the receptors in the taste buds making sour and acidic foods taste sweet. After eating a miracle berry, a lemon will taste like lemonade. The trees prefer full sun and are easy to grow and provide a fun and amusing way to enjoy tart foods. Mountain Apple, whether the ‘Red’ or ‘White’ variety, are delicious fresh eating fruits and grow easily in most backyards. The trees can grow tall and produce abundant fruit several times a year, usually in the summer months. The ‘Red’ variety is easier to market as it does not show blemishes to the skin. The ‘White’ variety will turn slightly pink if left on the tree until fully ripe. The flowers appear directly on the trunk and branches and carpet the ground a beautiful crimson red or snow white. Mulberries produce abundant fruit that is about one inch long, dark purple when ripe, sweet and tasty. The fruit is delicious eaten fresh and can easily be made into jams, pie fillings or colorfully added to a fruit salad. The trees thrive in most locations here and are best maintained in bush fashion with ease. They fruit more abundantly after each trimming, as the berry is borne on the new growth. Nutmeg is a beautiful tall, slow growing tree, native to Indonesia. The yellow husk of the nutmeg splits open to reveal the mahogany seed surrounded by a crimson lace coating. The brilliant red coating is the spice Mace. Within the rich brown shell is the prized Nutmeg seed. Both mace and nutmeg is used in sweet and savory dishes and drinks. The tree is tropical and does beautifully in the moist areas of the state. They are long lived, grow dense and have very few pests or diseases. The trees need male and female flowers to produce fruit which are most commonly on separate trees. Pak Lan or Michelia Alba is a large flowering tree cultivated for its immensely fragrant blossoms. The profuse flowers are highly prized for their delicate fragrance. Both the flowers and leaves are highly aromatic and can be used in cosmetic applications. On a warm humid night, the scents can be enjoyed several hundred feet away. The tree has long flowering season, up to six months. Passionfruit are vigorous vines, producing abundant stunning flowers and great tasting fruit. ‘Lilikoi’ or the ‘Yellow Passionfruit’ is the most common of the passionfruits in Hawaii. It is most often used as a juice and is rich and acidic. It also makes excellent jellies and dessert toppings. ‘Purple Passionfruit’ is a sweet fresh eating variety that prefers some shade and grows well upslope. ‘Jamaican Passionfruit’ is a soft skinned orange variety with a sweet flavor. The ‘Orange Passionfruit’ has a hard orange skin and sweet juice. The ‘Giant Granadilla’ or Giant Passionfruit is shade-loving with large flowers and football sized fruit. It is not as flavorful as the other varieties. The pepper vine is slow growing and can be easily grown in Hawaii under the light shade of a tree or in a container with a trellis. It is attractive, prolific, ever bearing, and one of the most useful spices. ‘Sugarloaf’, a sweet white Pineapple has melting white flesh, and a soft edible core. They are extremely sweet and rich in flavor. Pineapples are easy to grow and harvest. The fruit is ripe in August and September. Puakenikeni flowers are amazingly fragrant and popular as lei flowers. The tree is small and spreading, grows well from sea level to 3,000 feet and the flowers are plentiful much of the year. In Hawaiian Puakenikeni means “ten cent flower”, which they sold for in the 1930’s when first introduced to Hawaii. Pulasan is closely related to rambutan. The fruit is generally sweeter than rambutan and has a berry like flavor. Instead of soft hairs like rambutan, the fruit has soft short ‘spines’ and is dark purple when ripe. It is tropical in it requirements, growing best out of the wind with a warm moist climate, and generally bears fruit every other year. Rollinia deliciosa is a fast-growing Annona from tropical America and is native to Brazil. It is a medium-sized tree of less than 15 feet in height, and bears within 3 years with proper care. The sweet delicious custard-like fruit is best eaten fresh or made into a smoothie. The trees prefer full sun, good drainage and regular watering and fertilizer. The trees generally flower in early spring and fruit in summer and fall. The fruit, contrary to its name, is sweet and can be stringy. It is eaten fresh or chilled and is often made into candy, sorbet or juice. The small tree bears the large fruit directly on the trunk and large branches, and grow best below 1,000 feet in high humidity climates. Star apple trees are very beautiful, large and spreading. The glossy leaves have golden undersides that make the trees worthy just for their appearance. The fruit is about the size of a large apple with five small seeds that look like a star when the fruit is cut. The white flesh is sweet and delicious, and the skin contains latex and should not be eaten. The 'Green Star Apple' is very sweet with a green skin. The 'Haitian Star Apple' has a deep purple skin and the flesh is sweet and smooth. Trees grow best below 1,000 feet. Starfruit is a beautiful, easy to grow, early bearing tree. The yellow, star-shaped fruit are abundant, juicy and sweet. The fruit usually eaten fresh, with the skin and can also be used in juices, chutneys, or as a garnish or palate cleanser. 'B-10' bears large dense and delicious fruit. 'Kajang' bears large sweet fruit, but fewer - resulting larger, unblemished fruit. Kari is the most prolific and is self pollinating and a good pollinator for the other varieties. Trees grow best under 1,000 feet with wind protection. Surinam Cherries are native to South America. The trees or bushes are easy to grow and maintain, and prefer climates below 2,000 feet. They make an attractive hedge with the small leaves turning from pink to red to green. The cherry-sized, pumpkin-shaped fruits are excellent, high in Vitamin C, and are used in jams, jellies, and pies. Turmeric, called Olena in Hawaiian is a root that is a key ingredient for many savory Asian and Indian dishes. It has many health benefits and can be used in sweet and savory cooking. The plant is easy to grow and does best in full sun with high humidity. It loses its foliage in the winter, as some gingers do, and the leaves will grow back in the spring. Vanilla is produced from the bean pod of a vigorous climbing orchid vine that loves shade and prefers a humid climate. Extract from the true vanilla bean is very expensive and has a pure a delicate flavor, used in ice creams, cakes, candy, eggnog, etc. Production of the pod is increased with hand pollination. Vanilla is also available in a beautiful ‘variegated’ form. White Sapote, native to Mexico, has creamy white flesh with a sweet pear-banana-peach flavor. The round, green skinned, baseball-sized fruit is delicious eaten fresh. 'Denzler' is a variety with a longer than average shelf life. 'Suebelle' is a slightly larger fruit with some ‘stone cells’ near the skin. The trees are medium sized and spreading, they grow and produce well upslope, and need wind protection and good drainage.